The reason I didn’t post a gallery back in 2017 was that my laptop had died earlier on during the trip. Although I had global next business day repair/replace for my broken laptop, it was a service that Dell singularly failed to provide, so I had to I buy a temporary replacement. While this got me up and running again, it wasn’t able to handle my photo-editing software, so I was unable to produce a gallery. I always meant to do it when I returned home, but time came and went, there were always other things that needed doing, and the urgency slowly faded. However, on my return to Tokyo in July, I decided that it really was about time I got the gallery done, so I made a return visit to Kaido where I found that it was much as I remember it. There were a few minor changes though, the main one being in the layout downstairs. Last year, a pair of armchairs flanked the doors at the front. While these looked great and, if you could get one, made the perfect seat, they took up a lot of space and a result, downstairs always felt crowded, while getting from the door to the counter at the back could be something of an obstacle course. I was therefore pleased to see that the armchairs had gone, replaced by a two-person window-bar on the right, and an open space on the left. This one, simple change really opened up downstairs, considerably improving access. The only other significant change I found was upstairs where the little niche between the bookcases on the right, home to a two-person bar, was now had an armchair, which, while I was there, at least, was occupied by the DJ (which happened to be a laptop, playing some jazz). 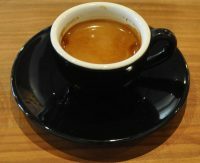 I had an espresso to mark my return, a rather lovely Ethiopian which was incredibly sweet, one of the sweetest espressos I’ve had in a long time. I was so impressed that I bought a bag of the beans to take home with me. Sadly I failed to make any notes about its origin, thinking that the information was on the packet (which it isn’t). It was really, really good though! For more about Kaido Books & Coffee, check out the full write-up, which now includes the complete gallery. This entry was posted in Bookshops, Cafes, Cake, Coffee Spot Updates, Evening Opening, Laptop Friendly, Late Opening, Sandwiches, Tokyo and tagged Tokyo2018 by Brian Williams. Bookmark the permalink.